When a page could not be found or some other error happens inside of your web application, a standard error page is displayed. The appearance of the error page is controlled by the error templates. 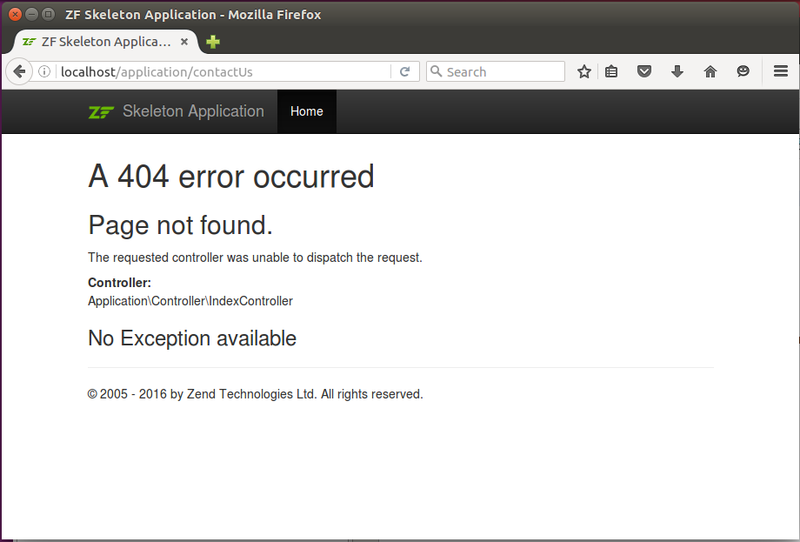 There are two error templates: error/404 which is used for "404 Page Not Found" error (shown in figure 4.10), and error/index which is displayed when a generic error occurs (such as an unhandled exception is thrown somewhere inside of the application). The display_not_found_reason parameter controls whether to display the detailed information about the "Page not Found" error. The display_exceptions parameter defines whether to display information about an unhandled exception and its stack trace. The not_found_template defines the template name for the 404 error. The exception_template specifies the template name for the unhandled exception error. You typically set the display_not_found_reason and display_exceptions parameters to false in production systems, because you don't want site visitors see the details about errors in your site. However, you will still be able to retrieve the detailed information from Apache's error.log file.